These are no ordinary princesses. 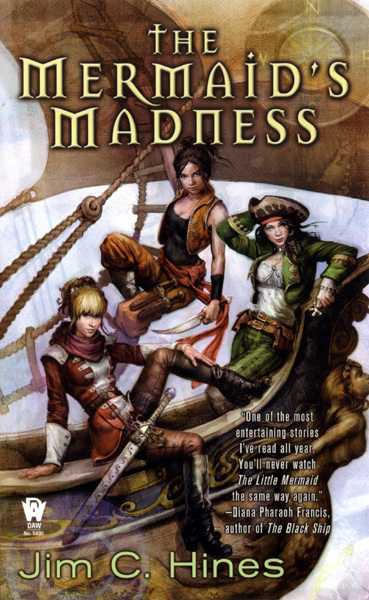 Jim C. Hines’ latest novel, The Mermaid’s Madness, came out recently, and since I’d not read the first in the Princess series, I bought them both at once [The Stepsister Scheme and The Mermaid’s Madness] and read them back-to-back. These books turn the three most celebrated princesses in fairy tale tradition into heroines rather than damsels in distress. With fast-paced plots, whimsical settings, and clever dialogue, it’s no mystery why so many people love Hines’ books. In The Stepsister Scheme, Cinderella (named Danielle) has married her prince and is looking forward to her happily ever after. But when her stepsisters kidnap the prince, Danielle teams up with Sleeping Beauty (Talia) and Snow White (Snow) to save him. As the queen’s secret agents, Talia and Snow are trained for this sort of thing. Talia is a martial arts master, Snow a powerful sorceress. (Don’t call her a witch. She hates that.) Their rescue mission takes them deep into Fairyland, where they encounter strange creatures, dazzling scenery, and the dangerous new magic Danielle’s stepsisters have acquired. Even with all their skill, Talia and Snow may not be a match for what awaits them. And Danielle the cinder girl may have to save them all. In this first book in the Princess series, I felt that the character development wasn’t quite up to par, with the exception of Snow. Talia was too irritable and moody, Danielle too sweet and naïve. While Talia does have a troubled past that comes out during the novel, I never got close enough to her to truly understand why she has such an attitude, which prevented me from feeling fond of her. (Hines solves that problem in The Mermaid’s Madness by making her a point-of-view character.) With Danielle, I just wanted to shake her sometimes, because her naivety caused a lot of problems. I felt that the plot relied a bit too heavily on that, making her more naïve than was believable. Snow, however, was very well characterized, and after two books, she remains my favorite of the three. The Mermaid’s Madness is a far cry from the original The Little Mermaid and the Disney version of the tale. Lirea is one p.o.-ed mermaid princess. She was scorned by the man she loved, and now there’s hell (or Davy Jones’ locker?) to pay. 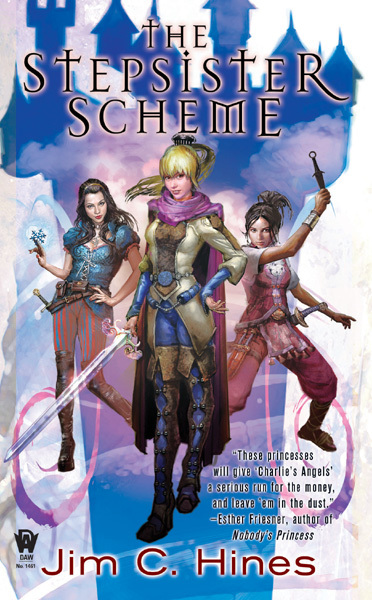 Once again, Danielle, Talia, and Snow set out to stop a crazy, magic-wielding menace before she hurts the people they love, along with many others. And the further they sail from home, the stranger—and more dangerous—things get. Not to say things weren’t strange and dangerous before they left. The queen has suffered a severe wound from Lirea’s magical spear. Should Danielle, Talia, and Snow fail to stop Lirea, the queen will die, and the kingdom could find itself at war on land and sea. I found the characterization much improved in The Mermaid’s Madness. Talia makes more sense, while Danielle is learning that not everyone is as nice as she. The secondary characters are deeper and more interesting as well. Not to mention the villain. Villains are much more engaging when they evoke your sympathy. The thing that makes these books stand out is that touch of fantastic whimsy. The Stepsister Scheme and The Mermaid’s Madness both feature settings, creatures, and magic spells that call out that sense of wonder. The girls ride to Fairyland in a basket hung round a falcon’s neck. They seek allies in a pixie saloon. They turn into mermaids and swim alongside kelpies. It’s stuff like this that brought so many of us into the fantasy genre, those “ooh” moments that make you feel like a kid again. The Stepsister Scheme and The Mermaid’s Madness were both fun to read. I can’t say I loved them, but I did enjoy them. They cast well-known fairy tales in a fresh and humorous light and offer a fast-paced adventure full of magic and surprises. Red Hood’s Revenge comes out next year, and there is potential for Jim C. Hines to continue the series for quite some time. Dang it! I knew this would happen! Now I must read them. And I have long wanted to read Jig the Goblin, too. Thanks for the review, Katie! Ok, I need to figure out how to get my co-author’s signatures to show up on the main page, and how to get them to link back to their own sites. Katie, I’ve updated this post to include a link to your blog. Thanks for a really well-written and engaging review! Thanks for the review of The Stepsister Scheme, Tia. I’ve had this book for a few months, but I haven’t gotten around to it yet. So many books, so little time. I’d like to read the Jig the Goblin books, too. I think my husband might enjoy them. Maybe I’ll give them to him for his birthday or Christmas and then steal them away from him! I read the first in the stepsister series and it was okay, but I’d agree with the review. In general, the characters weren’t that deep and with three of them, I failed to fall under the spell of any of them completely. I liked the Jig the Goblin series A LOT, especially books 1 and 3. Book two was a bit of a bridge book and the plot wasn’t as strong as 1 and 3.